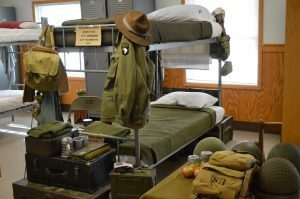 Fort Indiantown Gap, PA – In a catch-22 which would leave Joseph Heller scratching his head, the World War II Historical Association (WWIIHA) has voted to cancel its annual Battle of the Bulge event. The event – which has been held at the military training base of Fort Indiantown Gap for more than thirty years – could conceivably go on, IF the group meets a nearly impossible set of requirements imposed upon it by the United States Army. The exacting requirements set off a firestorm of controversy within the reenacting community, after they were first made public on Monday evening via social media. All were laid out in a statement about the cancellation by Association Chairman Larry Mihlon. One of the requirements is that reenactor leaders be trained in the fashion of officers in the U.S. Army. Currently, reenactor officers have no real authority over the men and women in their command. 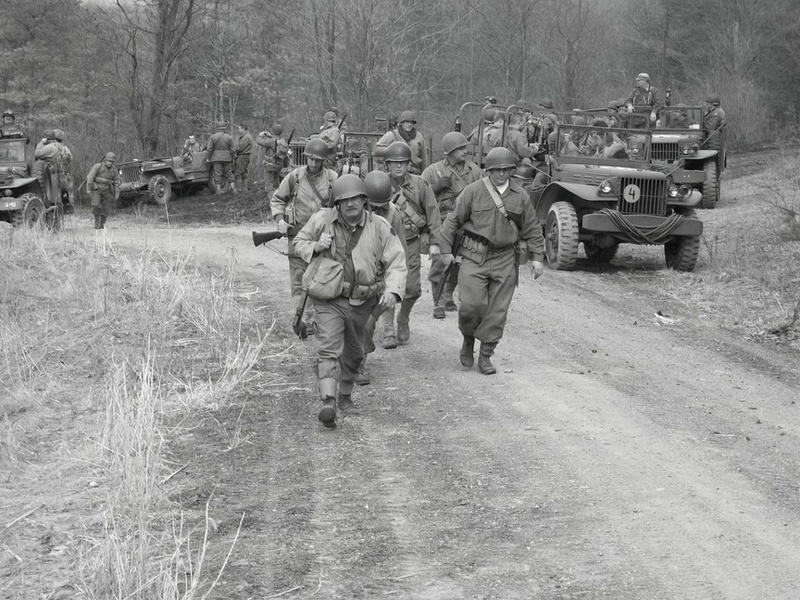 A second requirement is that all reenactors who take to the simulated battlefield be certified to U.S. Army standards in the use of WWII-era weaponry. Such standards – while part and parcel to the U.S. Army of 1944 – do not presently exist. “As Chairman of the WWIIHA Board of Trustees, it is my unfortunate duty to make the following announcement. It is with deep regret that we announce that the annual Battle of the Bulge event at Fort Indiantown Gap has been cancelled indefinitely. Members of the Board of Trustees of the World War II Historical Association have put countless hours into addressing the situations that have ultimately made this decision necessary. Here are the facts. 1. The Garrison will now require any and all reenactors who might wish to deploy to the “ranges” (the areas where the battle reenactments usually take place) to adhere to regular Army standards with regard to using any weapon whatsoever. This would include any and all hand and shoulder fired weapons such as handguns, rifles, etc. 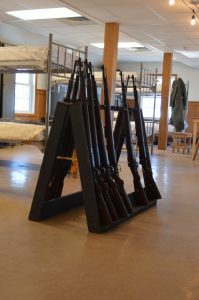 Individual reenactors would therefore be required to be certified with these weapons to US Army standards. Since we are using historic weapons, the Army has no way to confirm our level of training as none of their personnel are trained on any of the historic US weapons or allied/axis weapons of WWII. This is virtually impossible to comply with under just about any circumstances. 2. 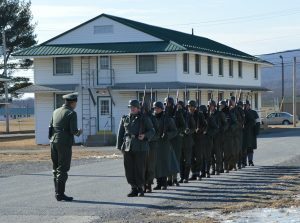 The Garrison will now also require that reenactors in leadership capacities adhere to Army standards of certification for non-commissioned officers and officers. This would require extensive education and training to achieve that is well beyond the ability of most reenactors. Compliance with this is also virtually impossible. 3. Social Media and other internet traffic relating to the event, which was seen by the Garrison, led to significant concerns. Social media has wide visibility and what was seen by Garrison personnel was cited as potentially creating a negative public perception of Fort Indiantown Gap. 4. Continued appearance of reenactor hand grenades and land mines in the field after our events has greatly disrupted military training because that normally generates an EOD (Explosive Ordinance Disposal) call which closes down military training until the area is clear. This is unacceptable to the garrison. They cannot allow this to continue, disrupting military training on an ongoing basis. We would like to thank everyone who has participated in the event over the many years, and to those of you who took on key volunteer and leadership roles to make the event happen. Mihlon’s statement addressed many of the rumors which had been circulating in the reenactment community ever since last February’s event had to be curtailed due to a serious accident on the mock battlefield. The statement, however, also touched off a series of bitter recriminations. Many blamed a few “bad apples” in the reenactment community. Some talked about a NAZI influence amongst the ranks of German reenactors. Others mentioned night-long beer parties on the base and a blatant disregard for the rules. In some minds, a conspiracy seemed to be afoot. In the interest of furthering the discussion about where the decision to indefinitely cancel the Battle of the Bulge reenactment may ultimately lead, the Baltimore Post-Examiner reached out to Mihlon with a series of questions. What follows is that interview in its entirety. BPE: Thank you for taking the time to address our questions. To begin with, please bring us up to speed on the history of the event and the process by which the decision to cancel was made. LM: To answer your questions, I need to clarify. Two members of the WWIIHA Board of Trustees met with command representatives of Fort Indiantown Gap Range Control. 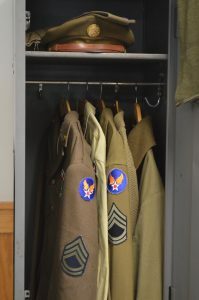 It is under their auspices and responsibility that reenactors have been permitted use of the field training areas (ranges), ultimately under the authority of the Base Commander. The Battle of the Bulge reenactment event had been in existence and conducted at Fort Indiantown Gap for over three decades. The WWII Federation turned over the administration of the reenactor part of the event to the World War II Historical Association in 2014. Many of the event staff remained, including WWIIHA President William Bethke and me. The safety record of this particular event has been nothing short of exemplary. Each year, hundreds of reenactors and living historians, from not only all parts of the US but also the international community, attended the event. Military style chain of command was used to manage the reenactors, some of whom had real military experience or were still serving. Great effort and detail were implemented as part of the management work. This year’s incident was the only one of its kind in the history of the event. However, diligence and investigation into the incident was a natural result and occurred over the months following the event. BPE: Given this year’s incident – a mortar-fire accident which required one reenactor to be hospitalized – and the Army’s concerns over things such as antique weapon handling, and prop land mines and prop hand grenades being left in the field, are the Army’s new requirements reasonable? LM: Absolutely. Their requirements are based on regular military standards. BPE: Is the association looking to appeal this decision – either in part or in whole? LM: No. The Range Control official we met with made it clear that we could of course apply to Base Command as normal, but the standards of “weapons” certification and leadership/responsibility while on the Post would still apply. BPE: Is the use of other military facilities – either open or closed – being considered? LM: A sign of the times we live in is the examination of all manner of events that may present risk. Risk management is therefore a common thread in the administration of events like these. That in mind, WWIIHA has yet to determine when, if and where any permissions may be sought to use military facilities for their events. BPE: Are state parks or privately owned hunting or camping grounds a possibility? LM: Yes. However, no specific plans have been finalized as of now. BPE: Since the Army no longer qualifies troops in the use of WWII-era weapons, what options does the association have to meet the Army’s requirements? LM: Marrying modern regulations and standards with vintage equipment is a difficult task. I don’t expect any resolution to that any time soon. BPE: Is this an opportunity for reenactors to up their game, with closed events specifically centered around training? LM: Yes. Many reenactor groups already have regular training and education oriented events. Many more have already indicated that to be a direction they’d like to take. BPE: What are the association’s plans moving forward? LM: WWIIHA is currently concluding the background work from the 2018 event. Other events may be in the works, but only after the logistics associated with the organization as well as this year’s event are completed. BPE: Is the association looking at the possibility of purchasing its own reservation? If so, where are you looking and what sort of acreage might be required? LM: WWIIHA had indeed been formed with the potential future goal in mind of the acquisition of its own tract of land for events. That remains a possibility. There are a myriad of qualities that would be sought for that, including sufficient space to conduct battle reenactments and an infrastructure to support a safe environment for the participants (such as structures, sanitation, access, etc.). BPE: If such a deal is executed on mostly undeveloped land, could a January event conceivably be held with reenactors bivouacking in tents instead of barracks? LM: Many reenactors enjoy bivouacking. However, cold weather events have safety concerns unique to the challenges that can present. BPE: What kind of feedback have you gotten from those in the reenacting community? LM: Reaction has been mixed. Many reenactors have responded maturely and responsibly. Others have not. This has come as a shock to many, including me. After the amount of time, effort and money spent in not only attending the event but in helping to run it for our friends, the members of the Staff are particularly saddened by this. BPE: Do you have any idea how this decision will affect businesses in the communities surrounding Ft. Indiantown Gap? LM: There will no doubt be a palpable impact on the surrounding area. Restaurants, gas stations and motels will likely be hurt the most. Aside from our event, there hasn’t been much call for almost 2000 people to visit Fort Indiantown Gap in late January. BPE: Would you briefly talk about the importance of these events from an educational and historical perspective? LM: Living history in general achieves something that is nearly impossible otherwise: It allows those involved, or who observe it as spectators, to come the closest that they’ll ever get to experiencing the past in a hands-on way. Seeing artifacts in a museum, or as photographs in a book, pales in comparison to seeing it first hand. One of the supreme honors associated with having had anything to do with the annual Battle of the Bulge event has been to connect with WWII veterans. These veterans also look forward to this event, and they were grateful for the reenactment community paying such a unique tribute to their service. In an effort to hear all voices in this important matter, the Baltimore Post-Examiner has reached out to members of the reenacting community, the press office at Fort Indiantown Gap, and other interested parties. We will print those reactions if and when they become available. Did he cite any examples? So much for the 75th Anniversary.